So, what a final day we have in prospect, next Sunday 4 October, in Women's Super League One. Chelsea know that a win at home to Sunderland will ensure their first ever league title, and they might not need that, depending on Manchester City's result at home to Notts County. Today was the day that Bristol Academy were relegated to WSL 2, while Doncaster Rovers Belles and Reading were promoted to WSL 1. Tonight was the night Chelsea guaranteed at least Champions League football, and Arsenal Ladies were mathematically ruled out of contention for the title. See you next week for what promises to be a thrilling finale. Good night. It was a superb win for Emma Hayes's side tonight but has it come at a cost for the Blues? Eniola Aluko limped off with a nasty-looking knock, so it remains to be seen whether Chelsea will have the benefit of her pace and energetic runs down the wing next weekend. "Chelsea are a top side. In the first half, I felt we did well. "If you're going to give the ball away in poor areas of the pitch then, ultimately, you're going to get beaten. "I can't fault the effort of the players. "I think the FA Cup was a big thing, psychologically for Chelsea. I think that will give them the strength to go and win next weekend." "We've made the Champions League so it is a massive victory for us. "To be honest, they frustrated the life out of me, but they won the game 4-0. They were clinical. "(Ji) is becoming even more settled (in the UK). Today she showed her quality. "For me, she was a star performer today. She was absolutely outstanding. "Fran (Kirby) is a wonderful character. I knew a goal was due for her. She has settled in really well, gets on well with all the girls. Tonight it was a good finish from her. "We want to lead from the front and I think we deserve to be where we are at this current stage." "They had a good spell in the first half but we scored goals at really important times. "We knew we had to come here and get a result. 2-0 for me is a really scary scoreline, so I'm glad we got the other goals. "Fingers crossed we lift it (the league trophy) next week." So, Chelsea stay in the driver's seat for what would be a first league title in their history. If they play like that again next week, surely they will finish the job? Liverpool had their moments tonight, at 0-0, but Chelsea punished them with a clinical display of finishing. The final whistle goes. Chelsea have secured at least a top-two finish, meaning Champions League football for the winter of 2016-17. But more significantly, they have kept the destiny of the league title in their own hands. Ana Borges goes into the referees book for a late challenge on Libby Stout, which caused that injury. Thankfully Stout appears to be OK.
Liverpool keeper Libby Stout is receiving treatment on the pitch. She looks in pain. Two minutes of added time have been indicated. Chelsea are heading back to the top of the league, ahead of the final weekend. Liverpool keeper Libby Stout does well to come and claim that corner, and it remains a four-goal cushion for the visitors. Tonight's attendance is confirmed as 1, 013 at the Select Security Stadium in Widnes. We are into the closing stages and Chelsea look very comfortable. They win a corner on their left flank. Asisat Oshoala has a go from range, but that is way off target. Liverpool are running out of ideas. They've been resoundingly beaten tonight. Chelsea are cruising to victory now then, and just how significant could this scoreline be in terms of their goal-difference? A draw in their final game might now see them win the league, unless Man City thrash Notts County by several goals in their final game. For example, a narrow 1-0 win for City, coupled with a Chelsea draw on the final day, would now not be good enough for City to overtake the Londoners in the title race. Ji So-Yun has her second of the evening and Chelsea's fourth. Gemma Davison bursts down the left and gets to the byline. She cuts it back perfectly for Ji, who tucks into the roof of the net, left-footed, with a first-time finish. Liverpool bring on Nigerian winger Asisat Oshoala for Line Smorsgard. The Reds will be pleased to welcome back Oshoala after injury. Chelsea make their third and final change of the night. Drew Spence is replaced by Laura Coombs in midfield, which is something of a straight swap, tactically. 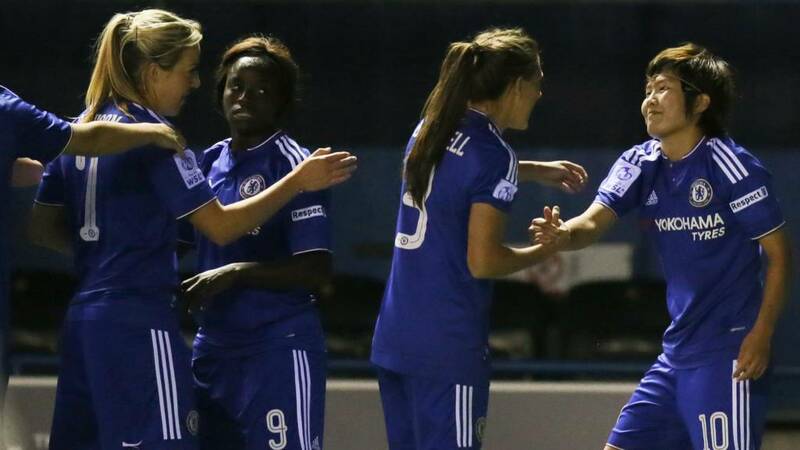 Worrying news for Chelsea as Eniola Aluko limps off with help from two physios. She is replaced by Ana Borges. The television microphones quite audibly pick up Aluko saying "stupid pitch" as she exchanges words with Borges. This match is being played on an artificial surface, I should point out. Make of that what you will. "Liverpool are getting worn down by Chelsea's constant attacks. They're still pushing for a goal of their own, but Emma Hayes' side are looking the more dangerous of the two." Liverpool have to keep banging on the door and hopefully get themselves a goal. Then who knows, if they can get another one quickly, Chelsea might be on the back foot. Gemma Davison tries her luck from the corner of the box for Chelsea but her shot goes wide of the far post. Chelsea want a fourth here. Rosie White shoots just wide of the post for Liverpool, when she looked to have beaten Hedvig Lindahl. At the other end, Chelsea break with pace again but Fran Kirby's shot is well held by Libby Stout. Drew Spence hits an ambitious shot from outside the area at the end of a fine passing move from Chelsea. Her effort flies wide but that perhaps shows how confident the Blues are at the moment. Ashley Hodson replaces Lucy Staniforth for Liverpool. Can that change the game for them? The hosts needs something to give them hope soon, if they have any chance. Line Smorsgard has a glorious chance for Liverpool to pull one back, but when one-on-one with Hedvig Lindahl she blazes over the bar. That's a shame for the Reds, who did well to get in behind the Chelsea defence. Chelsea have been clinical in those situations tonight - Liverpool haven't been. Is there any way back for Liverpool now? The third goal looks to be the killer one for the visitors. Chelsea look comfortable, and they have responded brilliantly to the gauntlet thrown down by Manchester City. Millie Bright replaces Chelsea captain Katie Chapman in defensive midfield. Chelsea punish Liverpool for a sloppy defensive mistake. Satara Murray stumbles and the ball runs for Eniola Aluko. She races onto the loose ball and calmly slots into the bottom corner to give Chelsea a big, big cushion in this game. Liverpool win a corner but Chelsea clear the set piece easily and we await the first real chance of this half. It is worth reiterating that, if things stay like this, Chelsea will take a two-point lead at the top of the table into the final day of the season, next Sunday. Third-placed Arsenal would be mathematically ruled out of the title race, too. Much like the start of the first half, things have started slowly after the break, but Chelsea have the first meaningful shot of this half, although Drew Spence's effort is easily held by Libby Stout. The hosts have made a change at the break, with Mayumi Pacheco replacing Ingrid Ryland. Back in Widnes, Chelsea get the second half under way. Congratulations are in order for Doncaster Rovers Belles and Reading, who both secured promotion to the top flight today. Doncaster came from behind to win 2-1 at London Bees thanks to two goals from Courtney Sweetman-Kirk. Reading won 3-1 away at Watford in the day's early kick-off before their promotion was sealed when third-placed Yeovil failed to beat Oxford. Birmingham have moved level on points with Liverpool with a 1-0 win at Notts County. Kerys Harrop scored with a late header to ensure David Parker's side the victory. With Bristol Academy relegated after losing 6-1 at Manchester City earlier today, Birmingham were already safe. BBC Sport's Jo Currie at the Select Security Stadium: "This the most attacking football that Liverpool have played in some weeks and they really should have gone ahead before Chelsea took the lead. Emma Hayes' side have been clinical when it mattered however and that's why they lead 2-0." So far, so good then, for Chelsea Ladies. After a slow start, they found their groove and have a two-goal lead thanks to good finishes from Ji So-Yun and then Fran Kirby. As things stand, the title race remains in their hands. Chelsea overlap down their left and Claire Rafferty tries her luck from a tight angle but her shot hits the side of the goal. We are about to see three added minutes at the end of the first half. Chelsea are into their stride now. As has been the case so many times this season, Chelsea are punishing their opponents with their sheer pace. Can Liverpool respond before half-time? Chelsea double their lead with a swift attacking move, led by Eniola Aluko and finished off by Fran Kirby. Aluko used her pace to get towards the byline, inside the penalty area, down the right, and she cut it back for Kirby, who used her movement to create herself a yard of space and then place her shot into the far corner from eight yards out. The Blues come forward again and this time Gemma Davison tries a curling shot from the left but her right-footed effort can't find the top corner, and goes out for a goal kick. Liverpool goalkeeper Libby Stout does very well to come out and intercept a long ball played towards Chelsea striker Fran Kirby. Kirby was surely through for an open goal there, if Stout had been just a second slower off her line. At the other end, Hedvig Lindahl does well to palm over the bar from Katie Zelem. Defender Niamh Fahey is back on for the Blues now, by the way. That goal has come against the run of play but what a touch from Ji, and what a finish. She pulled the ball down as it came over her shoulder, which is a really difficult skill, and it was a great finish. There are not many players in the league who could do that. So, after a quiet first 20 minutes, the pace of this games has certainly picked up. Chelsea have the opening goal, and it is a landmark goal for them too, as they become only the fourth team in Women's Super League history to net 100 times in the league. Class. Chelsea take the lead thanks to a wonderful first touch and finish from Ji So-Yun. They could so nearly have gone behind, twice, just moments earlier, but Gemma Davison's cross from the right is expertly brought down by Ji and the PFA Women's Player of the Year creates time and space for herself to smash into the roof of the net, and the Blues lead. For the second time in the space of 60 seconds, Liverpool hit the woodwork again! A corner came in from the right and Gemma Bonner rose highest to nod towards goal, but her header struck the frame of the goal. Can Chelsea ride this storm? Ingrid Ryland is so, so unlucky there for Liverpool. She hits a bouncing shot from outside the area, it beats Hedvig Lindahl in the Chelsea goal, but it doesn't beat the post. It hits the upright and bounces clear. Chelsea escape. Chelsea break forward with pace and Eniola Aluko bursts into the six-yard box. It looks as though she'll shoot....but she opts to cut the ball back and square it for a teammate, and her pass evades both on-rushing Chelsea forwards and Liverpool clear the danger. With Chelsea currently temporarily down to 10 players, while Niamh Fahey is patched up by the physio team, can Liverpool take advantage? BBC Sport's Jo Currie at the Select Security Stadium: "Chelsea's Eniola Aluko forced the first save of the game but so far possession has been even between the two teams." It looks as though Millie Bright is coming on in place of Niamh Fahey for Chelsea, but Fahey heads down the tunnel for further treatment, and the substitution is delayed for the time being. Natasha Dowie and Chelsea's Niamh Fahey clash while jumping for a header and Fahey has come off worst, appearing to have suffered a slight gash on the head. She receives treatment, but will she be replaced? That's a good stop from Liverpool keeper Libby Stout to palm away Eniola Aluko's placed shot. That was the first real effort on goal, after just over quarter of an hour. The England striker had time to pick her spot, from the edge of the area, but Stout read it well. So, who do you think will win the Women's Super League One title? Get involved and let us know by using #bbcfootball on Twitter. It has been a slightly subdued start from Chelsea, who are just finding their feet in this game, and they'll want to get the ball out wide more often, to Eniola Aluko and Gemma Davison. Chelsea come forward with their first attack of the game and win a corner. Gemma Davison, playing against her old club, raced into the penalty area but her shot was blocked and went wide. From the corner, the loose ball fell to Chelsea midfielder Drew Spence, who had a go from outside the area but she dragged her shot well wide. Most of the football has been played in Chelsea's half so far. No real efforts on goal to tell you about just yet. The hosts look bright in these early stages. If anyone is going to derail Chelsea's title charge tonight, it could well be Liverpool striker Natasha Dowie, who scored four times last time out, in a League Cup quarter-final win at Bristol Academy. Liverpool win a free-kick in the early moments, about 10 yards away from the right corner of the Chelsea penalty area. Chelsea do well to get the cross cleared, and then both teams exchange some early touches. Liverpool, playing in their traditional red kit, get us started. The players line up for the customary hand shakes, as "You'll never walk alone" plays out around the Select Security Stadium. Kick-off is fast approaching us. Can Chelsea cope with the pressure? A fair number of fans in blue have travelled up the M6 to support them this evening. As well as following our live text service this evening, you can also listen to live commentary on BBC Radio 5 live sports extra. Click on the audio icon above and Ross Heaton and Kate Longhurst will describe you the action. Tonight's game comes at the end of a big week for Liverpool Ladies. Manager Matt Beard, who guided them to consecutive league titles in 2013 and 2014, was named as the new man in charge of American NWSL side Boston Breakers, and will be leaving Liverpool at the end of the season. Beard will remain in charge of the Reds for the start of their Champions League campaign next month. Liverpool chief executive Ian Ayre said the search for a new manager would begin immediately. Will that have any factor on Liverpool's performance tonight? We shall see. Visitors Chelsea come into tonight's game looking to bounce back after a Continental Cup loss at Birmingham, but in the league they are bidding for a fourth straight win. Matt Beard's Liverpool side have failed to find the back of the net in their last two league games. In contrast, Emma Hayes' Blues have scored eight times in their last three league matches. Before we go any further, let's bring you tonight's teams. At the bottom of the table, Bristol Academy are relegated after being thrashed 6-1 by Manchester City in today's 14:00 BST kick-off in Women's Super League One. City led 3-0 at the break thanks to goals from Jill Scott, Isobel Christiansen and Lucy Bronze, before Nikita Parris added a fourth, Christiansen netted her second from the spot and Georgia Stanway made it six in the second half. Caroline Weir netted a consolation goal for bottom-club Bristol but the result now means that Birmingham City will be staying up. At the top of the table, Man City now have a better goal difference than Chelsea, which could be significant, come the final day of the season. Will today be the day that City take command in the race for the league trophy? Last year they let the title slip from their grasp in the final game. Now the pressure is on, once again, for Chelsea Ladies. After Manchester City's big win over Bristol Academy earlier today, we know for sure that the Women's Super League One title race will go down to the final day of the season. Two wins from their two remaining matches will ensure Chelsea lift the league trophy for the first time in their history. Standing in their way tonight are the 2014 champions, Liverpool. Can Emma Hayes' side hold their nerve and keep matters in their own hands?